Well things are starting to slow down a little for me, if that can ever happen with my life! LOL. My son is off to his new adventures in Colorado starting his new job this week. We will miss him but am so excited that he gets to start this new chapter in life! So I am down on Cape Cod for the summer (minus a couple of trips back to Tewksbury here and there). But that doesn’t mean that I am taking the summer off! I am soooooo looking forward to going to convention with my stampin’ friends in 3 weeks! Which means that I better get working on swaps! Today I jumped back into Mary Jo’s blog and the Technostamper challenge. I used the new designer paper Gingham Garden and the Flower Shop stamp set with the coordinating punch! I love the bright colors of this paper and the great patterns. Rather than using a ribbon across the middle of the designer paper, I used some of the new washi tape that coordinates with the paper. The background flowers are stamped in daffodil ink. the main flower is stamped with melon mambo ink and popped out with dimensionals. Of course I had to add a little something to the center of the flower, so added a rhinestone pearl. I wish I had the large pearls with me, but alas I don’t. I can’t bring everything to my temporary stampin’ studio! 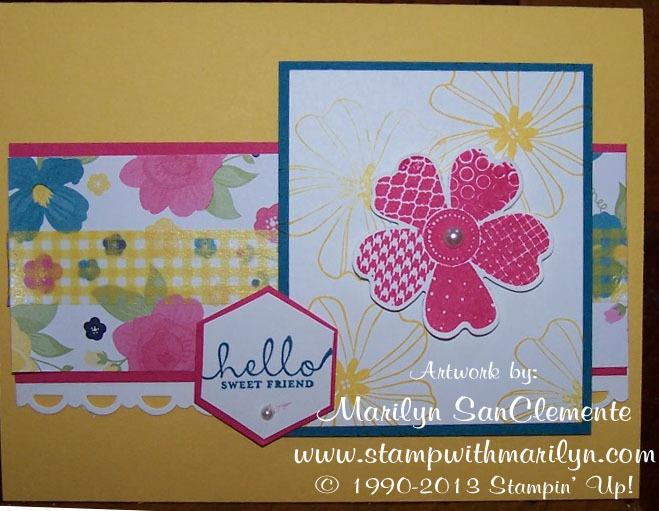 The Hello Sweet Friend is from the new Six Sided Sampler Set and I used the hexagon punch to punch out the image. Stay tuned, my next Card Kit is going to be using the Flower Shop stamp set with the coordinating punch! 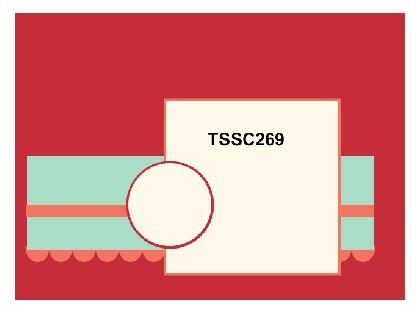 This week’s order code is ZTX476TP. Enter this code at the bottom of the order screen in the hostess code section! Enjoy your day! cards, handmade cards, Stampin' Up!, Technostamper challenge. Bookmark. My goodness I love this! A beautiful way to showcase all the new stuff! Thanks for sharing and playing along with us this week at Technostampers Monday Lunchtime sketch! Love this Marilyn, I can not wait to be able to get this set and punch–it was the first one I really wanted from the new catalog. This is a really fun card, love the colors. Enjoy you time at the beach! Thanks so much for playing along with my sketch challenge this week! Beautiful card! I love how you layered your hexagon greeting! Thanks for joining us for the Monday Lunchtime Sketch Challenge! There is a large piece of designer paper used on the background to create a great look. The LABELS COLLECTION FRAMELITS (p. 191) are used to cut out the two shapes. The top layer has all of that great water coloring on it. You can color with the blender pens/watercolor pencils or try the aquapainter with the ink pads. The bottom layer is also run through the BIG SHOT with the SQUARE LATTICE EMBOSSING FOLDER to add texture.